Less than four months after he assumed office, President Harry Truman had to decide whether to use nuclear weapons against a military target for the first (and, to date, the only) time in world history, knowing that thousands of Japanese civilians would be killed in the blast. In Gavin Hood’s new thriller, Eye in the Sky, a group of lower level politicians and bureaucrats grapple with a similar decision, albeit one with considerably smaller immediate stakes. As the film makes very clear, the decision doesn’t get much easier with even one innocent life at stake. Eye in the Sky is a topical thriller that raises a difficult moral and political question, both for the characters and for the audience. Namely, how much collateral damage is acceptable (a rather euphemistic way of saying how many innocent people can be killed) to prevent a greater tragedy? And, while the stakes are numerically considerably lower in this film, in one key way they are much higher. Unlike the Hiroshima and Nagasaki victims, due to modern technology—the “eye in the sky”—the single innocent life at stake is a young girl whom the characters and the audience spend most of the film watching. As the movie begins, a joint British/U.S. task force is monitoring terrorist activities in Kenya. They trace two of the world’s most wanted terrorists, including a British subject, to a safe house in Nairobi and begin planning a raid to capture the suspects. Those plans change when surveillance cameras inside the safe house (disguised as an insect, a bit of technological license the filmmakers use to good effect here) reveal that that two suicide bombers are in the process of arming themselves and will undoubtedly soon leave to attack populated targets. The task force has to decide whether to launch a drone missile strike before the terrorists leave the safe house, since, once that occurs, it will be virtually impossible to prevent a suicide attack. Even though Eye in the Sky will probably attract the most attention for the political issues it raises, it’s a topnotch suspense film as well. The movie takes place in near real time, over the course of a couple of hours. The film’s centerpiece isn’t original, but director Hood has borrowed from the best here. In one of his less heralded films, Sabotage, Alfred Hitchcock used the device of having a young boy deliver a reel of movie film that he’s told must arrive a particular time. What the audience knows, and the boy doesn’t, is that the film canister contains a bomb, and each delay puts the boys that much closer to death. Hood has chillingly updated one of Hitch’s best moments to keep a 21st century audience on the edge of its seats. In another clever touch, the task force tracking the terrorists is spread all over the world. U.S. intelligence personnel in Hawaii identify the suspects, while an Air Force pilot, Lt. Watts (Aaron Paul) pilots the drone that is surveilling the safe house and will launch the missile. Meanwhile, at an English army base, Col. Powell (Helen Mirren) is in overall military charge of the mission, and, in London, her superior, Gen. Benson (Alan Rickman in his last onscreen role), serves as a liaison between Powell and the various government bureaucrats and ministers who must authorize any action. By putting those responsible for the planned drone strike in antiseptic, near sterile environments, Hood magnifies their isolation from the events on the ground, creating an almost surreal atmosphere. He amplifies this even more by putting an undercover intelligence agent (Barkhad Abdi) in harm’s way, on the street near the safe house, so the agent can assist the military. He actually finds himself getting too close to the action and attracting the attention of a street militia and forced to run for his life. As a political statement, Eye in the Sky shows the bureaucratic mindset at its worst. Those making the decision include the worst type of CYA flunkies who are most concerned with avoiding a public relations nightmare that will reflect badly on the government. They are more than willing to kick the ultimate decision upstairs to the foreign minister (Iain Glen), who is suffering from a bad bout of food poisoning. 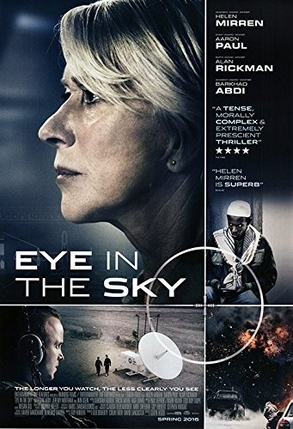 Eye in the Sky is also a tribute to two of the best actors around, Helen Mirren and Alan Rickman. The film is a fine farewell to Rickman, who is perfectly cast here as the counterpoint to the dithering politicians. His eye rolling and sardonic tone of voice are perfect. As for Mirren, she has one of her best roles in years. Despite being nearly 70, she is quite convincing as a hardnosed commander, who, in one key scene, essentially orders a subordinate to lie about the possible collateral damage in order to get approval for the drone strike. The storyline of Eye in the Sky feels a bit too convenient at times (the terrorists take an inordinate amount of time preparing for their mission), and the ending adds an extra touch that was really unnecessary and gratuitous. Yet, it’s as slick a piece of entertainment as you’ll probably find all summer and, on top of that, a movie that raises a very important and topical issue without giving the appearance of pandering to either side. The film is also a personal triumph for director Hood, whose career appeared on the rocks after Wolverine and Ender’s Game. Like a precision drone, Eye in the Sky squarely hits its target.